Last week saw the interesting news that Crystal Cruises was going to undertake a feasibility study on whether the hull of the old s.s. United States could be revived and out back into service as a 21st Century cruise ship. The results of this determination should be known by the end of this year. Elsewhere, we look at “cruise ship creep” as different classes of cruise ship keep getting progressively longer, with more berths in each case. And the Ocean Liner Society has chosen to take this year’s annual group cruise on Pullmantur’s Sovereign, a ship that when built in 1988 was the world’s largest cruise ship. Crystal Cruises, a unit of Hong Kong-based Genting International, announced last Thursday that it was considering acquiring the former United States Lines flagship United States to re-engine, convert and run as an upmarket cruise ship with a reputation. It has appointed retired US Coast Guard Rear Admiral Tim Sullivan to head a task force to examine whether the s.s. United States can be brought into compliance with the latest standards, and returned to ocean service. The liner, once the fastest in the world, has been idle since 1969. 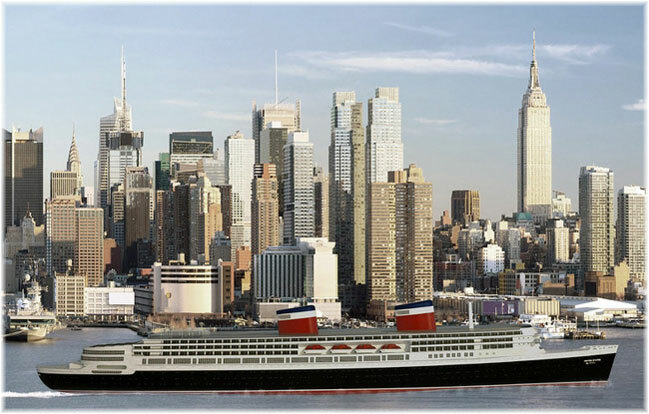 During the announcement, which was made at the Manhattan Cruise Terminal in New York, Crystal committed to covering all costs associated with preserving the ship while undertaking this study, which is expected to be completed by the end of this year. One can see where Crystal might foresee the United States coming in by comparing her to Hapag-Lloyd’s Europa 2 with a passenger space ratio of 76.5 tons per lower berth and the new Seven Seas Explorer, which will come in at 73. Of course, Crystal’s three newly announced newbuildings will far surpass all of this with 1,000 passengers on a 100,000-ton ship giving a passenger space ratio of 100! The executive director of the s.s. United States Conservancy, Susan Gibbs, is the granddaughter of the great ship’s designer, William Francis Gibbs. But this is not the first time that Genting International has owned this ship. Genting through Norwegian Cruise Line, which it then controlled, owned the ship between 2003 and 2010, when it sold her to the Conservancy. At the time, none of Norwegian’s feasibility studies had found an economical way to reactivate the ship. The proposed United States by Crystal Cruises would be transformed into an 800-guest- vessel featuring 400 luxurious suites of about 350 square feet each, with dining, entertainment, spa and other luxury guest amenities that are true to the ship’s storied history. Features such as the Promenade and the Navajo Lounge would be retained, while a new power plant would allow her to take the title of fastest cruise ship in the world. Crystal will examine different itineraries for the 60,000-ton vessel, including not only traditional Transatlantic voyages from New York and cruises from key US ports, but also international voyages around the globe as part of the line’s World Cruise program. The s.s. United States was launched in 1952 and captured the transatlantic speed record on her maiden voyage, a record that stands to this day. She is the largest passenger ship ever designed and built in America. Before her retirement in 1969, she had transported four US presidents, assorted royalty, many of Hollywood’s golden era stars and a million other passengers. She was designed as part of a Pentagon program that stipulated she could quickly be converted into a troopship capable of carrying 15,000 troops in the event of war. Her 240,000 shaft horsepower plant could take her 10,000 nautical miles, almost half way round the world, without refueling. In October 2015, the s.s. United States Conservancy’s Board of Directors announced that the persistent challenge of covering the vessel’s monthly expenses had compelled them to explore a potential sale of the ship to be responsibly recycled. This news resulted in the public support that allowed the Conservancy to raise additional funds to continue its preservation efforts and pursue negotiations with potential investors and partners. The Conservancy will continue to expand its collections as it advances its mission of educating the public about the s.s. United States. Under the plan, the organisation would work with Crystal to establish shipboard displays and other educational programs. Planning is also underway for a land-based museum. 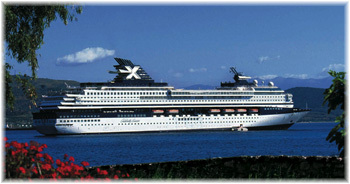 One of the first instances of cruise ship creep occurred with Celebrity Cruises’ Century class, when the name ship of the trio, the 70,606-ton Century, was completed in 1995 to a length of 807 feet with 1,750 lower berths. By the time her 73,850-ton sister ships Galaxy and Mercury were delivered in 1996 and 1997 they had gained almost fifty feet in length, measuring out at 852 feet with 1,908 lower berths. The Century trades today as the SkySea Golden Era, while the Galaxy and Mercury sail as Mein Schiff 1 and Mein Schiff 2 but are earmarked to find their way to UK-based Thomson Cruises when TUI Cruises receives new tonnage. TUI Cruises too have joined this trend, with their Mein Schiff 7 and Mein Schiff 8, due in 2018 and 2019, to be built longer and to measure above 100,000 tons, carrying 2,860 passengers compared to the 2,506 carried in the present 99,700-ton series, Mein Schiff 3 through 6. Last week, at the steel cutting ceremony for the MSC Meraviglia at STX France, MSC Cruises joined this trend when it announced that the third and fourth units of its St Nazaire-built Vista class cruise ships would be built to larger dimensions. MSC Meraviglia (Hull E34) and sister ship F34 are due for delivery in March 2017 and early 2019, while the two Meraviglia-Plus class ships, Hulls G34 and H34, will be delivered in October 2019 and September 2020. Where MSC Meraviglia and sister will be 1,033 feet long and measure 167,600 gross tons with 4,492 lower berths, a new 63-foot midsection will give the Meraviglia-Plus ships a length of 1,086 feet on 177,100 gross tons, producing a new total of 4,888 lower berths. The maximum capacity of the Meraviglia-Plus ships will be 6,297 passengers compared to 5,714 on MSC Meraviglia. The longer Meraviglia-Plus class ships will allow MSC to extend the interior promenade from 315 feet to 364 feet. The lengthening will also allow for more public spaces, including boutiques, two more alternative restaurants, and a new art gallery. 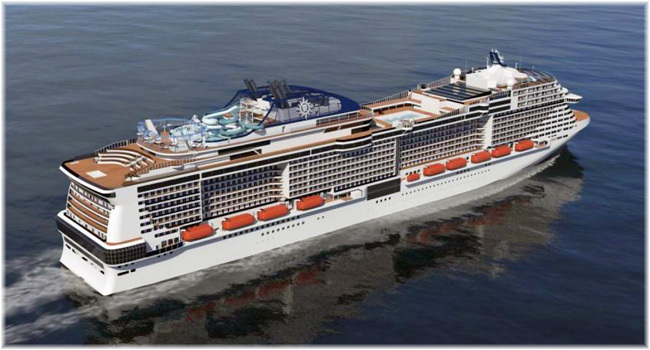 MSC Cruises also has three “Seaside” class ship on order from Fincantieri in Italy, measuring 1,060 feet in length and 160.000 gross tons, with 4,140 lower berths, for delivery in 2017, 2018 and 2021. While the UK’s Ocean Liner Society has been taking annual group cruises for many years now, many of these have been on Pullmantur ships. 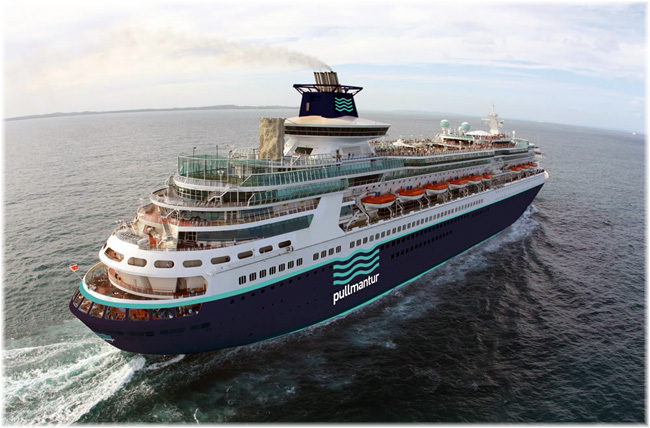 It is now over a decade since the Society first cruised with Pullmantur in the 39,241-ton former Home Lines’ flagship Oceanic and the 46,087-ton Sky Wonder, formerly Sitmar Line’s Fairsky. In more recent years, the Society has chosen Pullmantur’s associate Croisières de France and its 37,301-ton Bleu de France (now Saga Sapphire) in 2010, and 46,811-ton Horizon in 2012. For 2016, it is back to Pullmantur’s Spanish-based fleet with a 7-night cruise from Barcelona on the 73,192-ton Sovereign, once the world’s largest cruise ship. Leaving Barcelona on Saturday, September 24, 2016, this year’s cruise will call at Olbia, Civitavecchia, Livorno and Toulon before returning to Barcelona on October 1. The Ocean Liner Society is a non-profit organisation whose members celebrate the passenger ship in its many forms. Members of the general public can qualify to travel on this cruise by joining the Ocean Liner Society. Membership is £20 in the UK, £23 in Europe and £25 in the rest of the world.